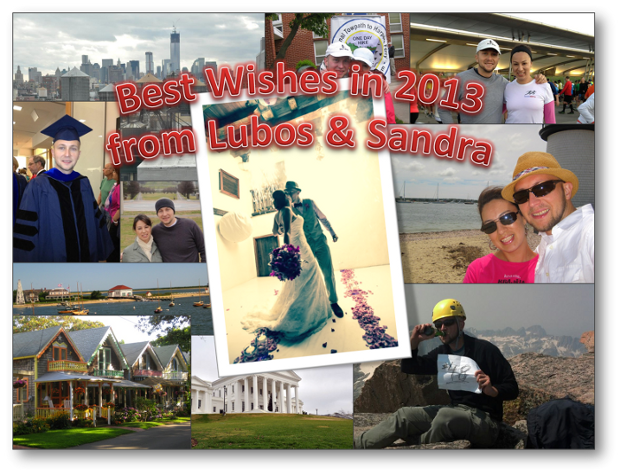 Happy New Year to all of you from Sandra & Lubos! Hoping all you had a wonderful year and that this new one will be even better. It was indeed a great year for us – and quite busy! The highlight was by far our wedding. Sandra and I got married September 22nd at Hotel El Marques in Cartagena, Colombia. Sandra is originally from Bogota, Colombia, and we both loved Cartagena on our first visit in 2011 so that’s why picked it for the wedding location. It was so much fun!! We may be a bit biased, but this was definitely the best wedding we have been to! 🙂 My dad, my sister, and my aunt flew in from Slovakia the week before, and we spent the time before the wedding sightseeing. Most of the guests then arrived Thursday afternoon, and we all met for sunset drinks at an outdoor bar located on the old colonial wall surrounding the old city. The next day we went on a boat trip to one of the islands, and then that evening spent partying on a party chiva bus. Saturday morning our guests spent sightseeing and then joined us for the ceremony and the reception in the afternoon. We partied until 2 in the morning and even had an hora loca (crazy hour) consisting of a troupe of carnival-style dancers. No Slovak dishes at the wedding (we considered doing goulash for a midnight snack but figured it would be too much hassle), but our guests received in their welcome bags mini bottles of slivovica, borovička, and Fernet stock, along with an assortment of Horalky and Milka. After the wedding, we and the families stayed for another week in the all-inclusive Decameron Baru resort. It was great, all you can drink mojitos, and absolutely gorgeous crystal-clear swimming pools. This was also a year of “wrapping things up” for me. First, after four years, I got my 3 stripes – I graduated with my PhD in aerospace engineering from the George Washington University in May, just a few days after my birthday. Then in August, I completed a major step in a quest I set of in 2001 – a quest to climb the highest peaks of all US states. In August I made it to the top of Montana, Granite Peak, Montana’s highpoint. This was my final remaining continental state, all that remains now is Alaska (Denali) and Hawaii (Maua Kea). Montana has been a daunting challenge for a long time since it is the only highpoint requiring rock-climbing on the standard route. As you may read in the writeup on the climb, the trip was quite an adventure. However, I owe gratitude to my climbing partners for at least inviting me on this trip, since if it wasn’t for them, I would definitely still be stuck at 47. Sandra and I also got to do a bit of traveling this year. We visited Nashville and we both loved the live music scene in the downtown. We also made a trip to Guadalajara, Mexico, to visit her brother. The best part was taking the Tequila Express to Casa Herradura. Before this trip, I had no idea that tequila can actually be delicious. I like scotch on the rocks; turns out that Herradura on the rocks is just as delicious! We also made a trip to New York City, Cape Cod, and Richmond, plus few business trips that took us to San Francisco, Atlanta, and Houston. And of course, we were busy with cooking. My contributions to this site were not as plentiful this year as before, but this was partly due to me having already posted most of the recipes I am familiar with. But one of my big goals for the past year and also for the new one is to get better at baking, especially at making the delicate Slovak treats. I tried to make a few, some were better than others (the laskonky turned out quite well, I think), but it was all good. I’ve been experimenting with bread baking a bit, currently I have a batch of sourdough fermenting that will hopefully turn into a good rye bread in few days. We also made our first batch of home-made wine, our “Born on Christmas” Pinot Noir. I know you are supposed to leave it in the bottle for few weeks before drinking but I couldn’t help myself – and the first bottle was quite nice actually. Will keep you posted! Feel free to share your highlights too. And again, Happy New Year to you! Wonderful put up, very informative. I wdoner why the opposite experts of this sector don’t notice this. You must continue your writing. I am confident, you’ve a huge readers’ base already!|What’s Going down i am new to this, I stumbled upon this I have discovered It absolutely helpful and it has aided me out loads. I am hoping to contribute & help different users like its aided me. Great job.